By practicing the numbered vinyasa system within ashtanga yoga we can bring a new level of precision and concentration to the practice. How many vinyasa (movements) are in surya namaskara b? It is synonymous with practicing scales in music – sa ray ga ma pa dha ni sa ! As we count along in this class we test our ability to stay present and focused on the task at hand. Learning this method makes the movements into and out of each asana as economical and efficient as can be – take away flourishes and needless Chinese whispers that creep into the form. Techniques class: Arm balancing, handstands and headstand. Sequencing to open the shoulder girdle and upper body before an exploration of arm balancing from the primary, intermediate and advanced A sequences. Both beginners and advanced students will be given new techniques to unlock the handstand and make this pose accessible. Joey came to yoga in 1998 after a mis-spent youth pursuing the circus, martial arts and physical theatre. While at Goldsmiths University studying a BA in Drama he set up and directed the Yoga Society, there doing his practice of seva (service). On graduating he began assisting Hamish Hendry at Ashtanga Yoga London and for 3 years practised there and assisted daily. During this time he spent 2-3 months every year in Mysore with Sri K Pattabhi Jois (Guruji) and Sharath. 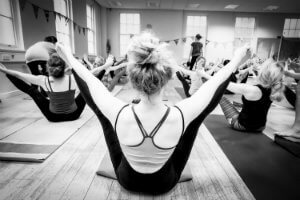 In 2004 he was authorised to teach the primary series by Guruji and following that taught daily Mysore classes from 2005-2008 at Triyoga in Primrose Hill, London. In January 2009 Joey relocated to Yorkshire with his wife Donna and their two children, Caleb and Daisy. 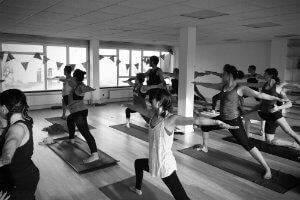 Joey started Ashtanga Yoga Leeds with the intention of supporting people’s daily yoga practice. Recently in 2012 Joey received Authorisation Level 2, meaning he now has Sharat’s blessing to teach the full Intermediate Series.